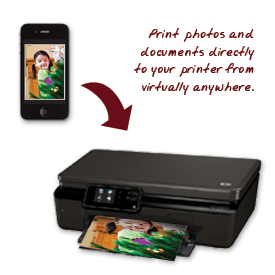 Product Review: HP ePrint printer Photosmart 5510 Now printing gets even easier! OK, I admit I am not the most tech savvy person around. I am over 60 and sometimes I feel like the computer world is literally passing me by, or I should say whizzing by. First I mastered email, then I discovered perusing the Internet and next I found Facebook, but I do all of this kicking and screaming. I really only pushed myself to learn to keep up with the lives of my children and grandchildren. One thing I miss, beside getting real mail, oh excuse me- “snail” mail, is photo albums. No one has “real hold in your hand and flip the pages” photo albums anymore, they just whip out their phone or their laptop to show off their child’s funny face or their grandchild’s adorable smile. I often wondered what if someone lost their phone or laptop? Would they loose all those pictures? Does nobody actually have picture frames in their houses anymore? So after getting frustrated that I never seemed to have any real photos to share, I received the new HP ePrint printer. It does everything except take the pictures. This printer has its own email address, so you can print using any device that can send an email. Basically if you can email it, you can print it. Now, besides posting this review on ButYouDontLookSick.com because I think it is cool, easy to use, and the readers might like it, I also thought of this idea. If your hospital has wifi, all you need to do is plug this in and your friends can send you pictures, cards etc. I am sure we all can thing of many uses! The HP ePrint printer works with all PC and mobile brands that connect to the Internet. It’s fast, its easy and even a grandmother can do it, So now I have a beautiful photo album of my two grandadughters to show you. For more info click here. I know there are more people are like to use HP ePrint printer and thy find more better print in here. To enjoy this printing technology it will be so well invention for us.